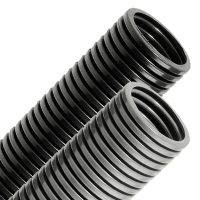 These heavy walled, highly flexible conduits are made specially for heavy indoor and outdoor applications with high mechanical stresses and are specially designed for applications requiring frequent reversed bending and continuous motion, e.g. for robotics. Internally and externally corrugated PA12 conduit. Designed for electrical installations and applications on machinery and general-purpose applications acc. to DIN EN 60204 and UL 1696. Also used for static and dynamic applications indoors and outdoors where additional cross pressure strength and high alternate bending strength is required.